Bowl, Salad, Nachos, Poki Wrap. Cucumber, Edamame, Seaweed, Onions, Avocado+1. Salmon, Tuna, Scallops, Crab, Smoked Squid, Shrimp, Tofu, Spicy Tuna, Albacore+1, Yellowtail+1. Aloha Sauce, Spicy Mayo, Citrus Ponzu, Da Bomb Sauce, Garlic Miso, Unagi Sauce. Green Onions, Fried Onions, Furikake, Jalapeños, Sesame Seeds, Masago, Lemon, Ginger, Wasabi. We believe community is important. So we would love to get to know you by connecting through one of our social media accounts. 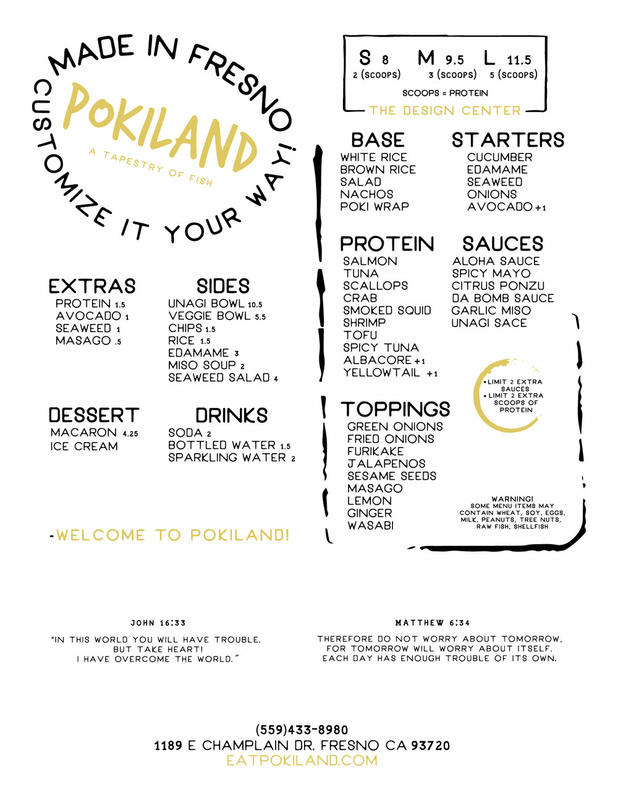 Feel free to subscribe to our newsletter or you can email us at contact@eatpokiland.com. We are looking forward to hearing from you!